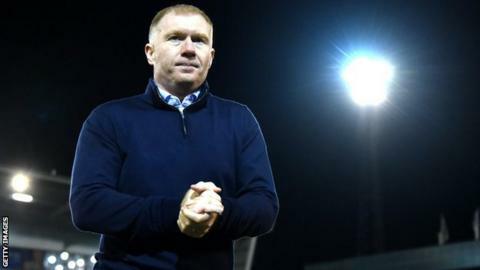 Scholes said: "It was nice, but it's just a start. That's all it is. I know there are tougher tests ahead, starting with Saturday against Crewe, who are going really well. "4-1 doesn't reflect how difficult the night was. Yeovil made it difficult for us. "I'm really pleased with the goals. I said in my press conference on Monday that I knew there was talent in this squad. "I want them to enjoy and express themselves and the way you do that is by scoring goals." Derby's Frank Lampard was victorious in his first league game as a manager in August, while Fleetwood's Joey Barton and Macclesfield's Sol Campbell both lost their first matches in charge.